The VIP lounge was okay. The free drinks, swag bag, and use of indoor restrooms did make the $30 price worth it, in my opinion, but I was disappointed by the lack of exclusive VIP vendors. 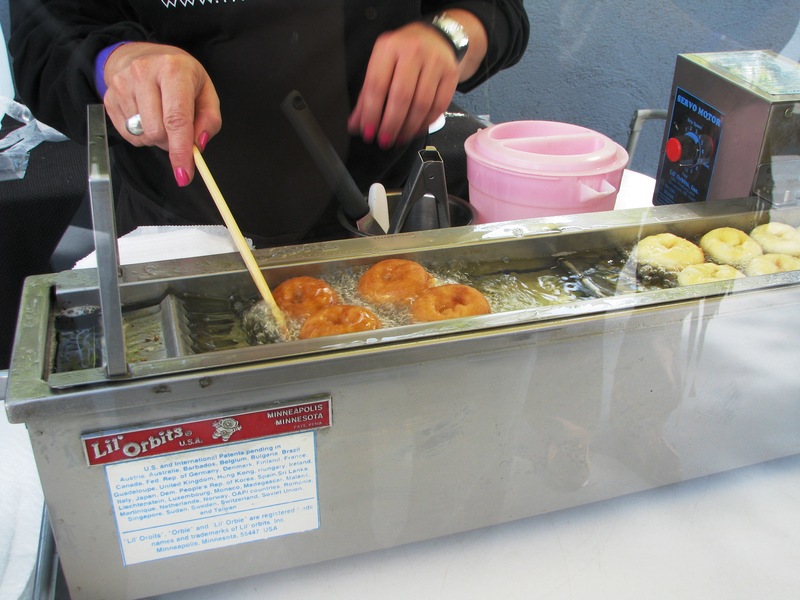 Only 3 were present on the patio – Dim Sum Truck, The Fry Girl and T Salon. A few more would have made the VIP lounge feel more…VIP-y. Dim Sum Truck was fantastic and I look forward to finding them on the street. 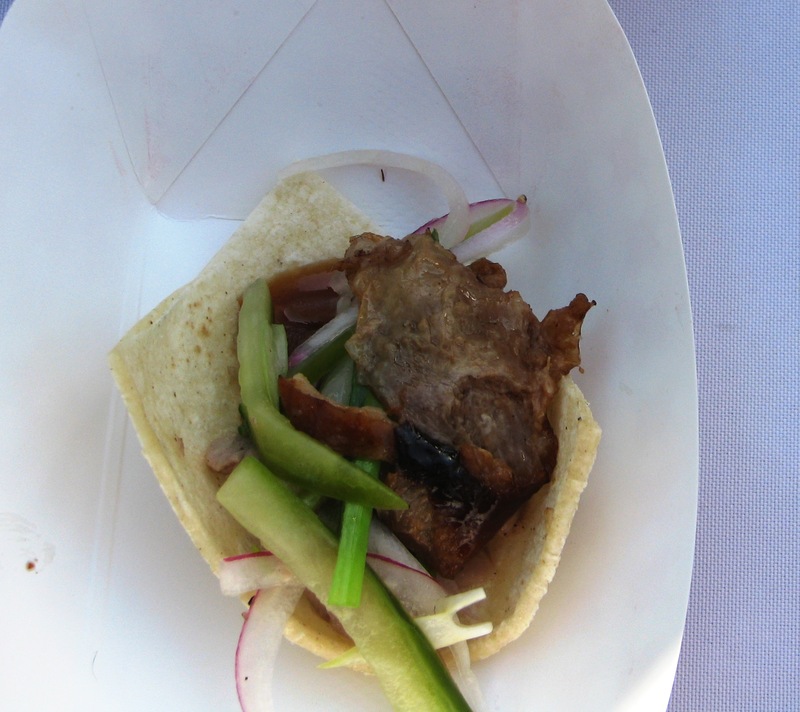 They were giving out samples of their roast duck taco and shu mai dumplings. The roast duck was delicious; they left the crispy skin on the duck! The shu mai was moist, plump and had good flavor though I found the soy sauce dressing they put on it a little on the salty side. The teas were actually quite good. They were giving out samples of a berry one and a chocolate-vanilla. I enjoyed the berry one more. We headed down to the main area to hit up some of the big-name trucks. First on my list was the Grilled Cheese Truck except the wait was already at 2+ hours. Um….eek? It would have been a great perk for VIP attendees to get a few “fast passes”. Wandering around, it seemed that most of the trucks had at least a 1 hr wait. The more popular ones like Ludo Bites, Komodo, Fry Smith and Buttermilk were around 2hrs. *sigh* Looking around, Coolhaus (gourmet ice cream sandwiches) barely had a line (that changed quickly as the day got hotter) so we rushed them. Coolhaus was doing 2-flavor sample bags for $3 or 4 flavors for $5. We went for the 4 flavors – brown butter bacon ice cream with chocolate chip, ginger snap with wasabi ice cream, chocolate with mint ice cream and strawberry ice cream with chocolate brownie. The brown butter bacon was good – rich ice cream with bacon bits. The ginger snap with wasabi was disappointing as I didn’t taste wasabi at all. The strawberry with chocolate brownies was a familiar and comforting combination. I’m not a mint fan so I didn’t try that one at all. Husband chowed down on that and had no complaints. These were the perfect size for consuming neatly and quickly in 2-3 bites. 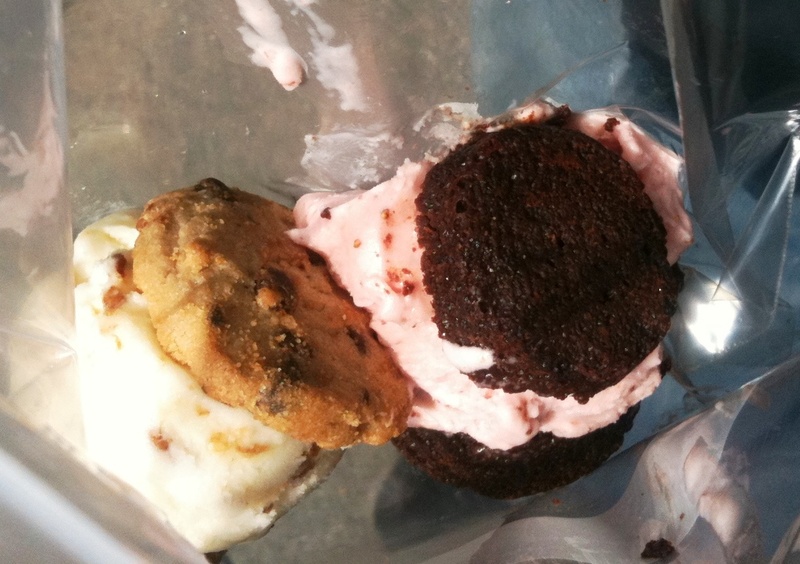 I hope they actually add mini-sandwiches to the Coolhaus menu. Next, up was Mama Koh’s chicken (Korean-style chicken wings) which was an actual stand vs. a truck. 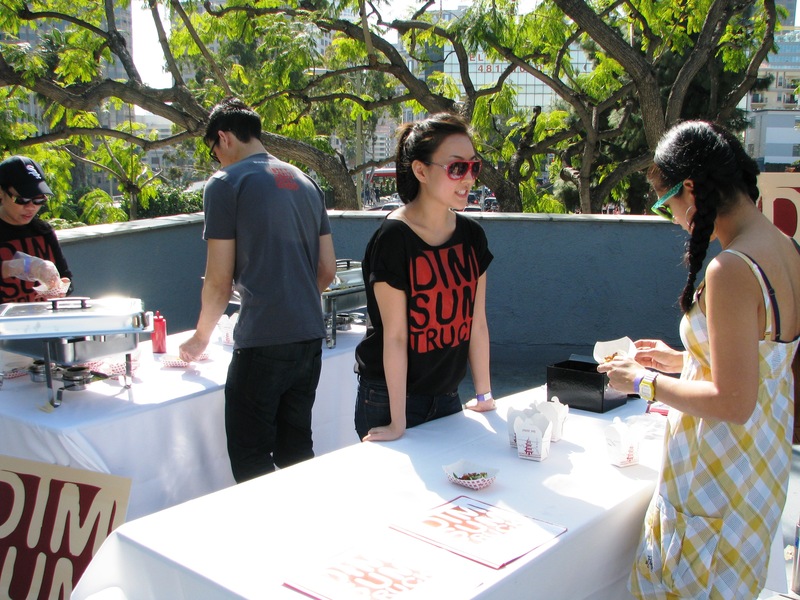 The LA Food Fest marked their debut to the public. They had almost no wait whatsoever. All the chicken had been prepared beforehand so all you had to do was pay and then grab a dish. Quick and efficient but the chicken wings lost their crispiness. 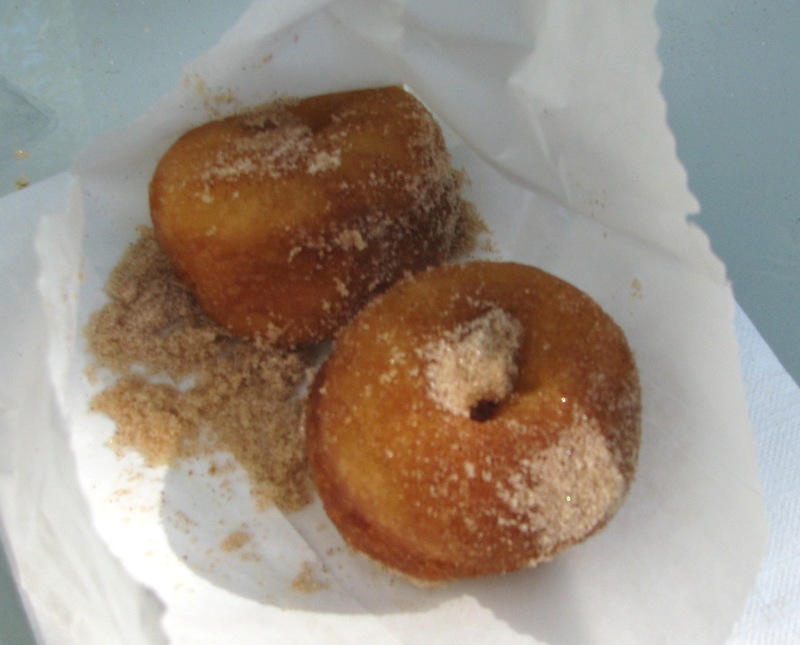 They were covered in a deliciously sweet n’ spicy glaze though. 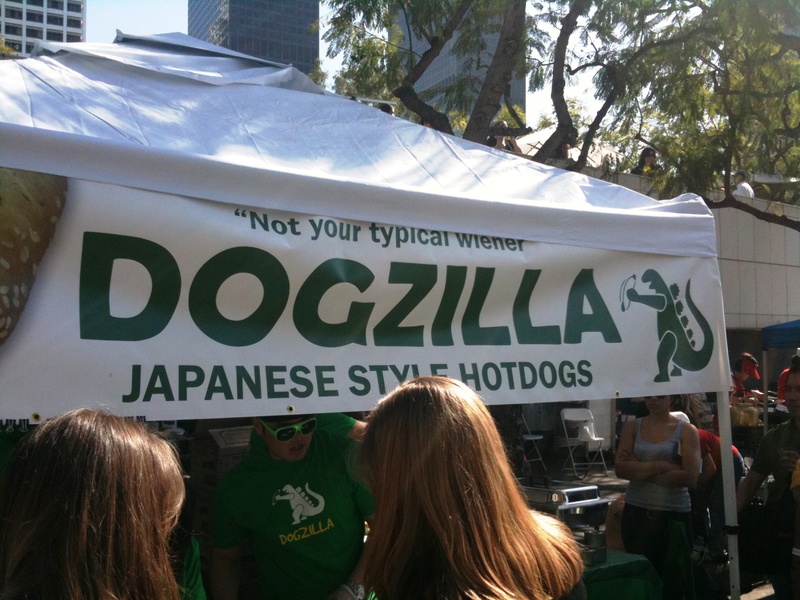 I enjoyed these and hope to see them popping up around LA soon. Another stand nearby, Sabor da Bahia was serving up Brazilian food. They were out of their chicken appetizer samples so I tried a black eyed pea fritter with some sort of shrimp paste on it. This was…not good eats to me. 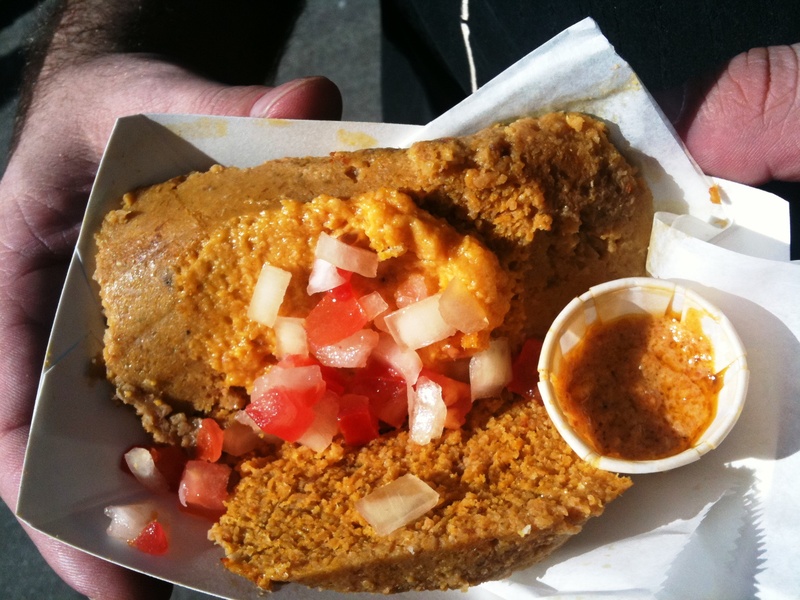 The paste was good but the fritter part was salty and extremely fishy tasting. I ended up tossing this. At this point, a couple of friends finally arrived (gotta love the LA traffic) and we ran around looking for something they wanted that didn’t have a crazy wait. We tried to brave Louks‘ line but ended up eating at Fresser’s as that line went quicker. The pastrami they served up was quite good – tender and very peppery. My friend said their pot roast was delicious. The caprese sandwich I had was mediocre. After our friends had their bite, we decided the crowd and heat were just too much to deal with and left to go to Wurstküche which ended up having a crazy line out the door. I was later informed that the Food Fest had started turning people away and that many more attendee-hopefuls didn’t even bother waiting in the long line. Those who didn’t get in flooded the nearby restaurants. 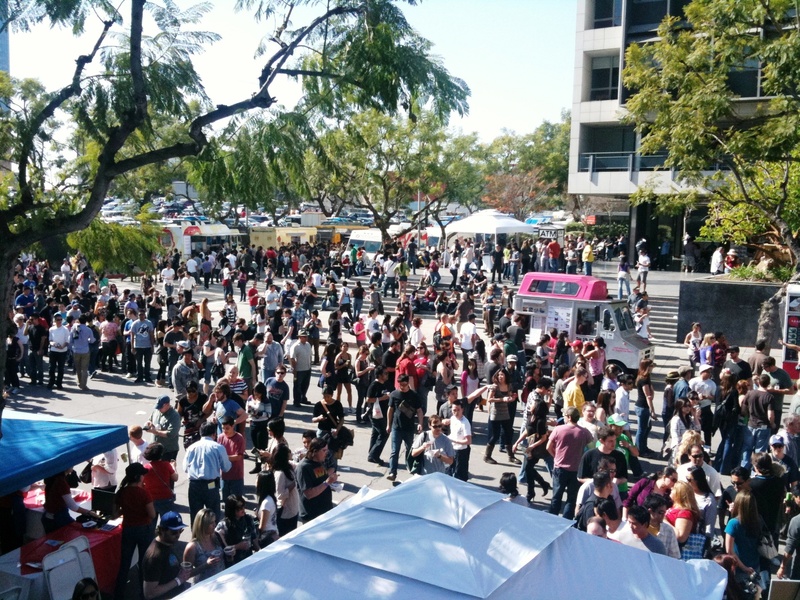 I don’t know much about the organizers of the Street Food Fest but I wonder if they had ever put together an event of this size. The venue they chose was fine and accommodating for the size of the event but there was a lot they could have done to improve the experience for their patrons. The first thing they could have done was limit the number of people. They announced they were expecting around 10,000 attendees. 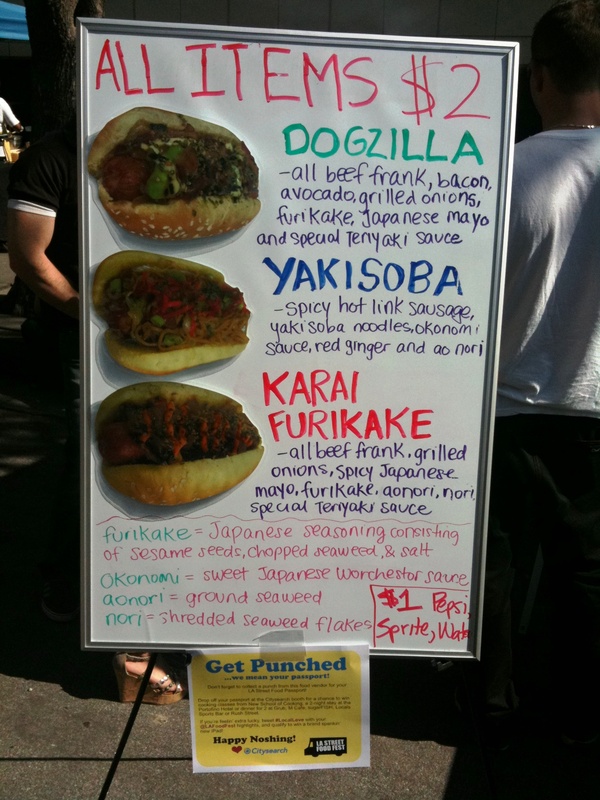 Frankly, I think that was too much for food trucks to handle. With only 2-3 people able to work in the space, cooking food “made-to-order” for those numbers without creating an enormous backup wasn’t feasible. On top of limiting numbers, spreading the food festival over a weekend instead of just one day would help mitigate the crowd issue as well (though there are costs associated with this, I know). Also, the organizers only released VIP tickets for presale and then later released a small number of regular tickets. Releasing all the tickets for pre-sale and selling whatever remained at the door may be a better choice for next year; it certainly would have help reduce the wait at the door. As for the lines, it was confusing trying to find the end and various trucks had lines that collided with each other. After my years at Comic-con, I know there are many creative ways to try and keep things orderly, one of which are End of Line signs. And worst case scenario, if it’s too long to manage, cut it off and ask people to come back in a half-hour. While I didn’t really get to try most of the trucks I was hoping to, I didn’t think the Food Fest was an absolute failure. It’s a great concept that was wasn’t executed as well as it could have been but it is the first year so kinks are to be expected. If they do it again, will I return? Absolutely. Though I fully plan on getting VIP tickets again and being there well ahead of opening… In the meantime, I’ll be hunting the various trucks I didn’t get to try on the streets.